Helmets – HTML Template for Handyman Created by 7oroof. This templates have specific characteristics, namely: Helmets is a clean and unique multi-purpose HTML template for all kinds of Handyman sites & business. Helmets Perfectly suited for Construction companies, Cleaning agencies, Mechanic workshops, Plumbers, Auto-shop markets, Carpenter workshops, Maintenance services, Metal Construction companies, . 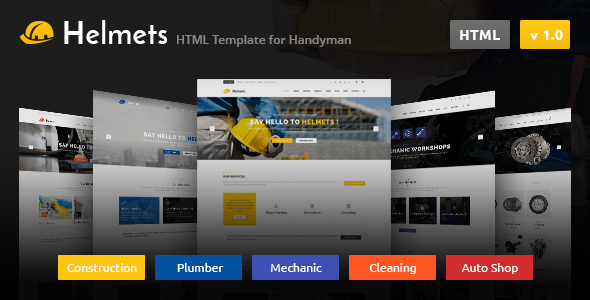 You can use this Helmets – HTML Template for Handyman on Site templates category for architecture, carpenter, cleaning, construction, constructor, corporate, electrician, engineering, handyman, industry, maintenance, mechanic, plumber, remodeling, renovation and another uses. Helmets is a clean and unique multi-purpose HTML template for all kinds of Handyman sites & business. Helmets Perfectly suited for Construction companies, Cleaning agencies, Mechanic workshops, Plumbers, Auto-shop markets, Carpenter workshops, Maintenance services, Metal Construction companies, Mining services, Electricity and Power Companies, Renovation business & any kind of handyman business. Helmets comes with necessary features for construction & handyman websites such as about pages, Testimonials, Clients, questions & answers, gallery, services, projects & single project pages, awesome blog pages, and +300 awesome blocks and options. This HTML template can easily satisfy all of your needs.